EU-ACT experts made a total of 4 presentations and moderated 3 discussion panels. The presentations included the review of the initiatives of EU in this field. The intervention of Spanish Prosecutor was considered very interesting for the audience, in this regard the Spanish model of a Specialised Prosecutor Office on drugs and Specialised Court to deal with drugs and OC created a big expectation as an interesting best practice to be studied in Ukraine. This issue opened a very interesting debate that was followed for the rest of the Conference sessions. 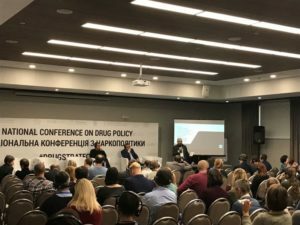 The final recommendations of this conference will be sent to the Cabinet of Ministers of Ukraine and it includes, among others, the recommendation to study and consider the establishment of the mentioned Specialised Prosecutor Office and Court for Drugs, following the Spanish or analogue model. The other issue that focused the interest of participatns (also included in the final recommendations) was the need to consider alternatives to punishment for drug-using offenders. Many issues remained opened for further discussion but this event was a good starting point to strength the cooperation among Public sector and NGO´s as well as international partners including not only EU-ACT project but also UNODC.